THIS is the RAREST Label Version of EPA-5141... Some think the Maroon label, then the Orange Label are the RARER of all the label variations, but that is WRONG. 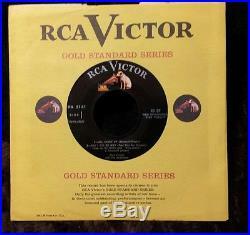 RCA issued some of their 45's out of their Hollywood pressing plant with these labels which had a more "Colorful ", Nipper Dog on top of the label and had a different silver print. In ALL 50+ years of MY collecting Elvis Presley's records, this is only the 3rd one I've ever seen. I just upgraded my copy and this one is my backup. The cover is in NM Condition, still in the tougher thicker plastic shrink and the 45 itself has NEVER been on a turntable but has a couple of minor paper scuffs from being in the sleeve and moved around all of these years so I'd say it's a NM. This is the way it was when opened from it's Factory state. ALL 3 edges of the sleeve are flat & PERFECT. 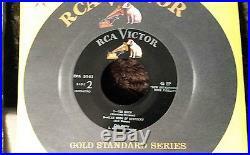 Back to the RARE Label Variation : These labels are still being uncovered on various Presley 45's. One that I've always had framed in my collection is, " Rock-A-Hula Baby ". I've always called these the " GOLDEN Nipper " label due to the awesome coloring of the Nipper Dog and the more BOLD and DIFFERENT Silver print. I've discovered about 14 of these different labels on Presley 45's and EP's. BOTH the " Viva Las Vegas " 45 and EPA can be found with this RARE Label Variation and are FANTASTIC when framed for display. If you're a TRUE Presley collector, do your research on this EPA and you'll see that in comparison to BOTH the Orange and Maroon label versions, THIS ONE is the harder-to-find out of the three variations, not counting the common black label with the common "dull" Nipper Dog on top and "Standard" print on the label. Please ZOOM all pictures as the item you see is the item you will receive. 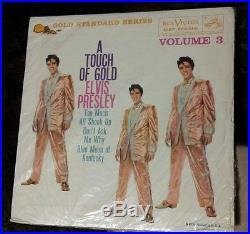 The item "Elvis Presley A Touch Of Gold Vol III EPA-5141 RARE LABEL RARE NM-/MN- RARE" is in sale since Thursday, December 21, 2017. This item is in the category "Music\Records". 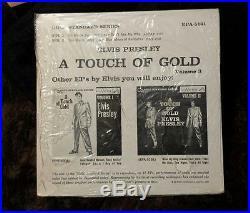 The seller is "elvisdealer" and is located in New Port Richey, Florida. This item can be shipped to United States, Canada, United Kingdom, Denmark, Romania, Slovakia, Bulgaria, Czech republic, Finland, Hungary, Latvia, Lithuania, Malta, Estonia, Australia, Greece, Portugal, Cyprus, Slovenia, Japan, China, Sweden, South Korea, Indonesia, Taiwan, Thailand, Belgium, France, Hong Kong, Ireland, Netherlands, Poland, Spain, Italy, Germany, Austria, Russian federation, Israel, Mexico, New Zealand, Philippines, Singapore, Switzerland, Norway, Saudi arabia, Ukraine, United arab emirates, Qatar, Kuwait, Bahrain, Croatia, Malaysia, Antigua and barbuda, Aruba, Belize, Dominica, Grenada, Saint kitts and nevis, Saint lucia, Montserrat, Turks and caicos islands, Barbados, Bangladesh, Bermuda, Brunei darussalam, Bolivia, Ecuador, Egypt, French guiana, Guernsey, Gibraltar, Guadeloupe, Iceland, Jersey, Jordan, Cambodia, Cayman islands, Liechtenstein, Sri lanka, Luxembourg, Monaco, Macao, Martinique, Maldives, Nicaragua, Oman, Pakistan, Paraguay, Reunion.